As you may have heard by now, Santorini volcano has recently been showing some unrest. Of course, it has only just come to the attention of the media, some of which have taken things a little further than can be justified. But for those of us involved in the work, this is a story which has taken rather longer to piece together. In my own case, the story started 26 years ago this week, when I first stepped onto Santorini during the first few days of my PhD research. Santorini was hot, dusty and felt rather exotic as it was my first taste of Greece. These steps launched me into my research career in volcanology and culminated, as I thought at the time, with the publication of the ‘Santorini Memoir‘, which summarised our reconstruction of the volcanic history of the islands over the past 600,000 years or so. But Santorini is such an iconic place to visit, and the geology is just so well laid out, that there always were reasons to return. So when a new PhD student, Michelle Parks, arrived looking for a project that would involve both ‘remote sensing’ (in this case, satellite observation) with field work on a volcano, Santorini was the obvious choice for a study of how volcanoes behave in between eruptions. In Santorini’s case, the last very small eruption was in 1950, but there was a rich record of carefully observed eruptions stretching back to 1707: a gold mine of information from which we could tease out ideas about how it might behave in the future. When we started work in early 2010, there had been no sign at all of any life in the volcano for as long as anyone could remember. Three years on, and that has now all changed: the volcano has just had its first ‘sharp intake of breath‘ since the last eruption, with the arrival of a fresh pulse of molten rock into the shallow crust, four or five kilometers beneath the volcano. In the time it took for the scientific paper to pass through the peer review system the rumble of tiny earthquakes which heralded this period of unrest has quietened down, and the volcano seems to be returning to slumber for just a little longer. This time, though, everyone is watching. 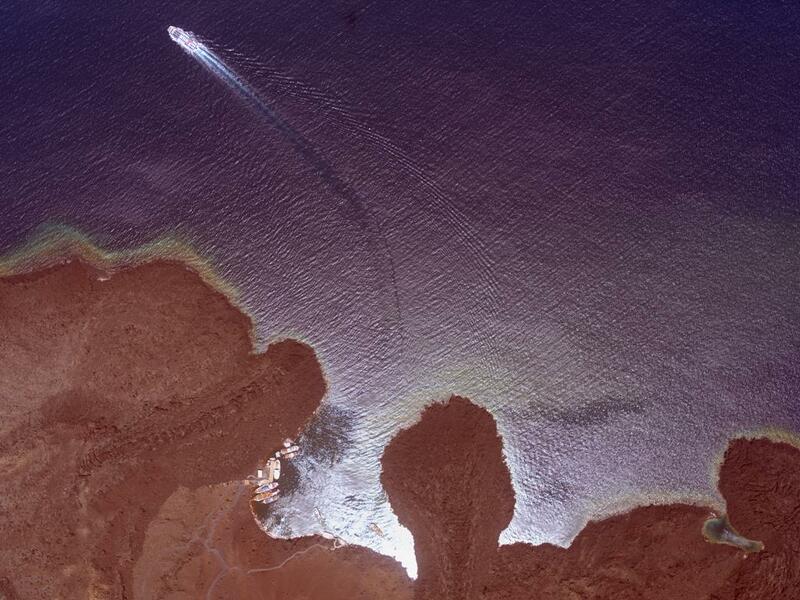 Air photo of the northern part of Nea Kameni, the youngest of the volcanic islands of Santorini. Taken in May 2012 by the NERC Airborne Research and Survey team.